This episode is currently not available. A smart looking terrace with an expensive problem to fix in Pontygwaith in Wales, a large Victorian house in Okehampton in Devon and an old pub in Sittingbourne in Kent all go under the hammer. All three property developers uncover unforeseen problems - find out if and how they sort things out. 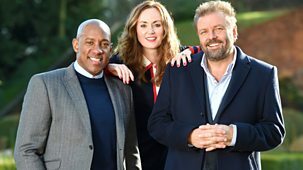 Martin Roberts and Lucy Alexander meet the developers who bought an eight-bedroom house, a semi-detached and an end-of-terrace house sold at auction. Martin and Lucy are in London, the Midlands and Scotland looking around properties sold under the hammer. But will any of the new owners manage to turn a profit on their projects? A flat in Sutton in London, a studio apartment in Chatham in Kent and a terraced house in Middlesbrough are all sold under the hammer. Martin, Lucy and Dion meet the new owners.